To make this blog easier to navigate and for readers to know what I think the best tacos in LA are (that I have so far reviewed) I added on the sidebar lists of the top 10 taco trucks and top 10 Taquerias. These lists will change as I eat more tacos with some dropping out of the top 10 and some entering it. For the sake of cohesion the taqueria list will include taquerias, taco stands, and mercados that sell tacos. For instance Los 5 Puntos will be under the taqueria list and El Parian, even though it is a birreria will also be in the taqueria column. 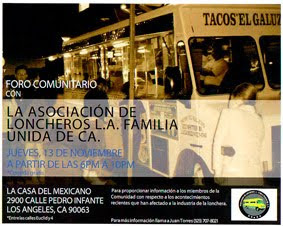 The taco truck list will include taco trucks, taco wagons, and taco carts ie anything that can be driven or pulled by another automobile. These aren't definitive lists considering they only include places I have been to. UPDATE: Someone asked why Kogi which I gave a 5/5 was not in the top 10 list. For now I am adding a separate list of top gourmet trucks. Maybe this will change and I will combine the two. But for now there are separate top 10 lists. so are your Top 10 Lists in any order or just your current favorite 10 places? 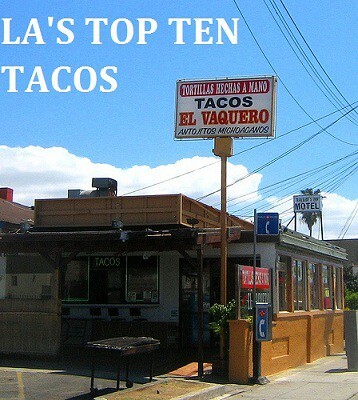 They are in order with #1 being the top taco in each category.